Understanding and Constraining Partiality in Adjudication. Forward 2: Jerome Morse, LL.B. R. & D. on D.A. "Justice is blind, but not to its own biases." Chapter 6, at page 152. Since the commencement of Fancy Barristers, P.C. we approached law not as business but as an ongoing struggle to improve our world within the Rule of Law (see "Our Philosophy" at Fancy Barristers, P.C.) through our enviable judicial system. Therefore, we established, amongst other important things, the "Charitable Advocacy Program", the "Law Student Scholarship Fund", the "Articling Program", and the "Class Action". 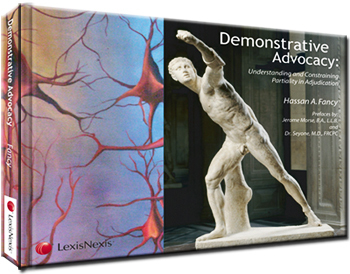 The Book "Demonstrative Advocacy: Understanding and Constraining Partiality" arose from several years of research, two years of exhausting writing, the use of visual definitions arising from a variety of legal proceedings and the help of numerous outstanding people. Consistent with our law firm's history, my purpose in writing the Book was to improve the administration of justice and advocacy by constraining bias during adjudication. Bias exists in every person and is based on the person's life experience. Life experience in cognitive psychology is known as "schemata" and in neuroscience as "memory". The unique life experiences of judges, including their education, are often their best qualifications to enter the judiciary. However, it is equally true that a judge's "life experience" is not evidence in any proceeding yet those experiences have a significant impact on all hearings. Justice is blind but not to its own biases. The problem though is not the judges; It's the evidence. The Book is the first legal publication to explain the problem of non-pecuniary bias by bridging the gap between law and the sciences. The Book explains the biological source and function of non-pecuniary bias (i.e. schemata or memory) in the comprehension of language based evidence (i.e. viva voce evidence or documentary evidence) by any trier of fact including judges. In 1968 Chief Justice Traynor (and others) held, without scientific proof, that words hold no meaning but are given meaning by users based on their "life experiences" (including Judges). See Pacific Gas & E. Co. v. G.W. Thomas Drayage etc. Co., 69 Cal. 2d 33 at 36 (Cal. 1968). A multi-disciplinary scientific approach is used in the Book to explain the problem of bias which approach was first proposed, but never implemented, by U.S. law professors in 2006-7. Justice Traynor is proven correct. The Scientific Advisor to the Book is a Director of the Acquired Brain Injury Clinic at Toronto Western Hospital and a Professor at University of Toronto medical school (Dr. Seyone). The Book is also the first to lay out a well tested solution to the ancient problem of bias in adjudication. 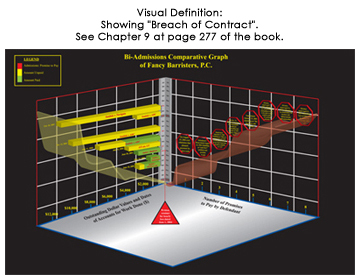 See some of the visual definition precedents under "The Book Contents" at "CD-ROM" in this site. The solution is based on the nature of the evidence tendered (not procedure, or presumptions). The solution is delivered in the context of the holding of Honourable Justices La Forest, L'Heureux-Dube, Gonthier and McLachlin in R. v. R.D.S. 3 S.C.R. 484. That holding set out the important principles permitting the use of "life experience" in adjudication but prohibiting same from affecting decision-making. No solution to achieve that apparent impossible goal was provided but science was not quite ready yet. D.A. provides the judicially tested and endorsed solution based on ground breaking science. More particularly the solution in the Book is rooted in the visual definition of language based evidence subject to the hearsay exceptions. Demonstrative Advocacy materially helps judges get to the truth (the paramount purpose of evidence), give meaningful effect to the Rule of Law and moves us beyond the erroneous ancient principles of Blackstone. It should then come as no surprise that the Honourable Madam Justice MacDonald held in Treyes v. Ontario Lottery & Gaming Corporation  (O.S.C.J. July 11, 2007) that Demonstrative Advocacy "constrains subjective interpretations, reduces acrimony, and expedites settlement."